Pressure Washing in London Clean Building or Your Money Back! 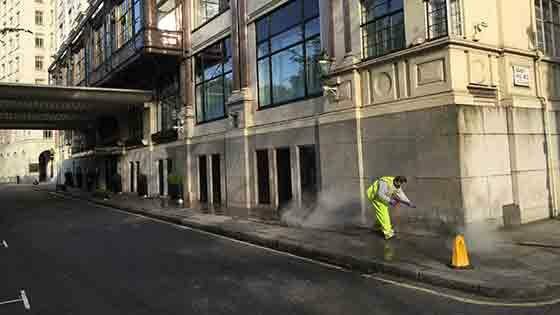 Purple Rhino pressure washing London offer exterior cleaning solutions for all types of commercial customers. We are experts at pressure washing to large car parks and concrete service yards throughout London and surrounding counties. Pressure washing London for motor dealers sales areas such as block paving and other hard surface areas will ensure a better experience for your customers and will keep the interiors of your cars cleaner. Our pressure washing services can include out of hours services to ensure minimal disruption to your business. We have invested in many types of pressure washing equipment to ensure we can remove all types of surface grime, organic matter, graffiti as well as oil stains. Our latest pressure washer is made by Hot & Mighty in America, it has awesome pressure washing abilities because it can pressure wash at up to 160 degrees which is ideal for removing oily substances quickly. If you have multiple site we can arrange Best Rates Guaranteed! Call Us On 0800 1577484 to arrange your site cleaning today! We can remove oils and grime from your premises using our hot pressure washing system. Our London based pressure washing teams will have your petrol filling station forecourt, pumps and canopy looking like brand new in no time. To arrange a FREE London Pressure Washing quote all you need to do is call 0800 1577484 to arrange a pressure washing survey. Emergency pressure washing is our speciality! 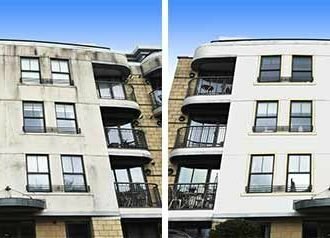 Pressure washing London often involves working at height and Purple Rhino have specialist pressure washing teams in place to carry out the cleaning works safely. 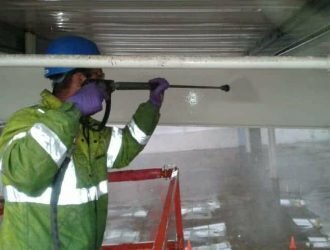 Our employees have CSCS, IPAF, PASMA and IRATA which enables them to carry out all types of pressure washing services to all types of surfaces. There are many different types of concrete mixes and this needs careful consideration when pressure washing, using too high a pressure may cause damage to the concrete surfaces. Wet lean mix concrete is often used for kerb bedding whilst PAV 2 concrete is used for external slabbing. C40 has a newton strength of 40 making it ideal for laying concrete lorry parks, pressure washing with cold water machines will remove organic matter such as lochens and mould growth, whereas rubber tyre marks will need removing by using hot pressure washing equipment including flat surface rotary whirl-a-ways or stainless steel Mosmatic types to ensure a smooth and even clean is achieved whilst pressure washing the concrete. We can remove chewing gum quickly and cost effectively by using our hot & mighty superheated pressure washers on block work car parks and walkways. The pressure washing systems we use are van mounted with 100 metre high pressure hoses which enable us to work quickly and efficiently causing you and your customers the minimum of disruption whilst pressure washing to your supermarket is undertaken. 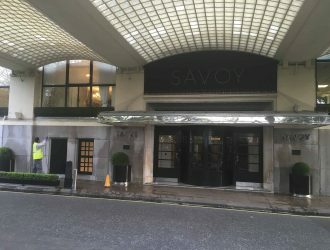 If you are looking for any type of surface to be pressure washed in London why not give Purple Rhino a call on 0800 1577484 now to arrange your cleaning requirements. London brick is not as hard as you might think and is often best cleaned using super heated steam rather than a cold water blaster which may cause damage to the bricks surface. 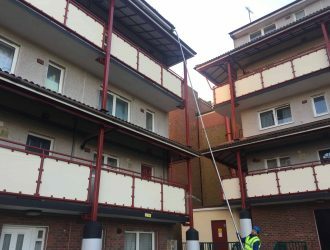 Usually in London the surface contaminant is carbon based which is not easy to remove, therefore it may be necessary to use a specialist pollution removing additive which should be tested before general application and pressure washing. Many driveways can benefit from pressure washing London team Purple Rhino. We have experience in pressure washing Indian sandstone, York Stone. Limestone, Granite, Cast Concrete and for schools and nurseries wet pour play areas can be pressure washed clean using our expertise. If you would like a pressure washing quote, simply call us now on 0800 1577484 and leave the hard work for us. We offer the best pressure washing services in London! 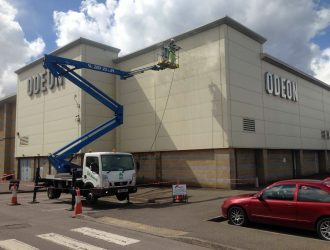 Modern Cinemas have large car parking areas with heavy footfall from their customers – chewing gum and fizzy drinks soon make the place look unsightly. The answer is to use a mobile pressure washing team to quickly make the leisure centre look like new. 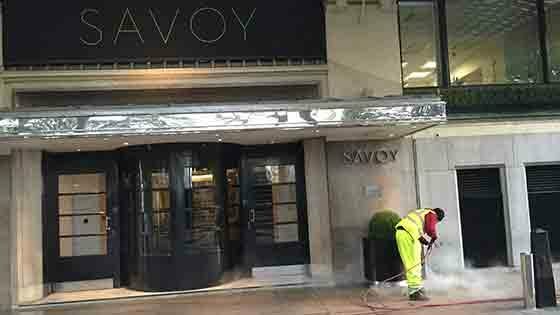 London is the most amazing capital city in the world and has many international visitors and citizens – let’s keep it clean by arranging your pressure washing services on a regular scheduled visit. To remove chewing gum from pavement and parking areas it is essential to use extremely high temperature pressure washing equipment. High water flow at a minimum of 130 degrees C is best used to quickly remove hundreds of pieces of gum stuck on the surfaces surrounding your premises, large areas for example three thousand square metres in front of shopping areas and entertainment venues would take about five days/nights to clean the whole area free from chewing gum. The pressure washing company will need van or trailer mounted equipment with an on board pressure washing water tank to provide a constant water flow to the hot pressure washer. Because these types of areas are busy during the day it is often better to remove chewing gum during the night. There are lots of Pressure Washing Companies to choose from but are you sure about their credentials, choose a Jet Washing Company who has a proven track record in offering pressure washing services and you wont go wrong. If you want a FREE quote or to Simply book in our services call us on 0800 1577484 today!